Granola is great. I'm sure that you'll all agree. I have so many granola recipes. I don't usually repeat the same recipe for it. I like to switch it up and make it different each time. That explains why I have so many recipes and variety is beautiful! 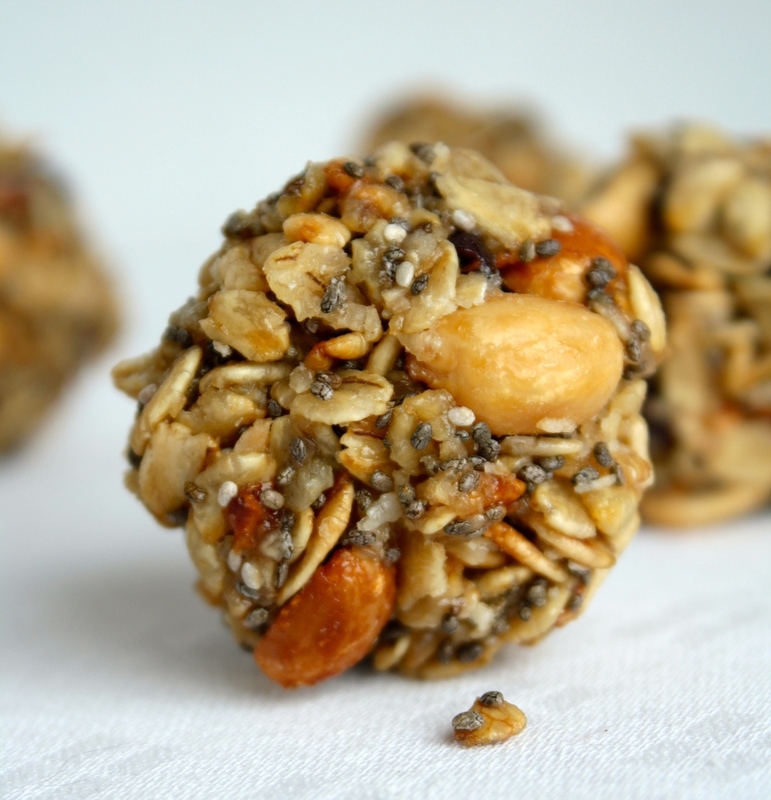 The last granola recipe I posted is somewhat similar to this one... but not really. I mean, a lot of the ingredients are the same but this is in a whole different part of the granola neighborhood. Speaking of neighborhoods reminded me of NYC neighborhoods; Soho, Tribeca, Gramercy, Astoria, Williamsburg. Ah, it's been so long. I could write about NYC all day. But enough about that. Let's talk food. I didn't get to try this out yet mainly because it hasn't been nice enough for a long enough period of time for me to do so. But I had this idea that these would be perfect pre/during/post workout snacks. Specifically long distance runs for me. I can't wait to get back into running again. I run a few times during the winter. I usually don't go if it's under 32 degrees F and treadmills are not my friend. 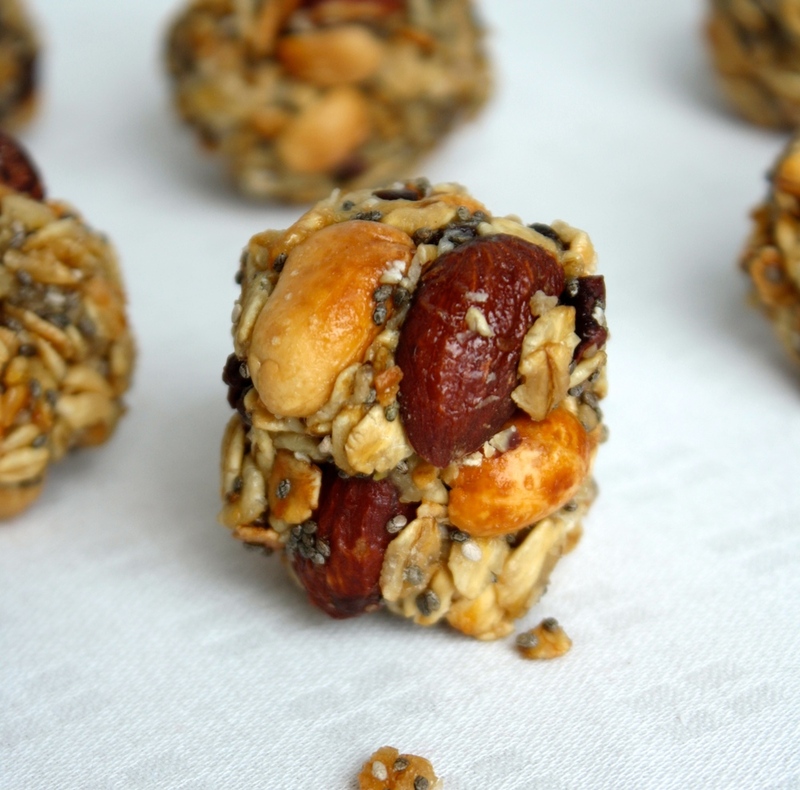 These bites would be the perfect way to fuel up your body regardless of your workouts (or lack of workouts)! Pop a few of them in your mouth and you'll be running around like the energizer bunny. Creating a compact ball of energy just gets me excited. Loaded with healthy fats to reduce the risk of heart disease, stroke, hypertension, depression, boost the immune system, etc., etc. Yes! Healthy fats are your friends. Don't let anyone tell you that all fats are bad. Nope, not true. Anyways, back to the bites. Small and easy to carry with you for an anytime pick me up. Crunchy and sweet. But not too crunchy and not too sweet. That's the perfect way to describe it. Basically, happiness. Yes, happiness bites. Here we go. Preheat oven to 350 degrees. Combine all dry ingredients together in a large bowl. Add in 1/2 cup of agave or maple syrup and mix together until dry ingredients are covered. Spread out onto parchment paper lined baking sheet. Bake for 30 minutes; stirring around halfway through. Remove from oven and add remaining 1 tablespoon agave or maple syrup. Stir. Let cool for 10 minutes. 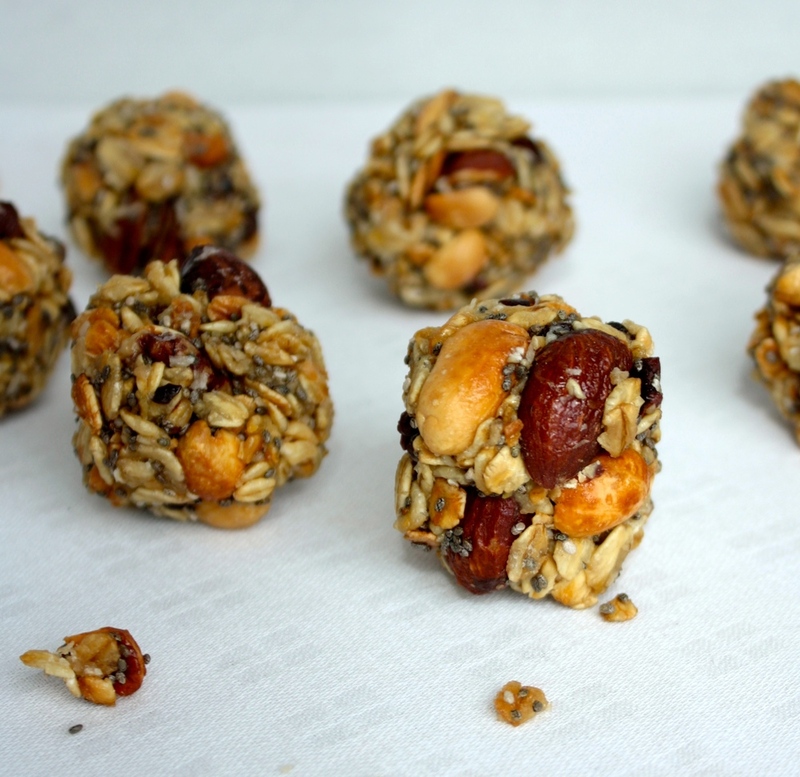 While granola is still warm form into small/medium sized bites. Let cool completely. Serve, enjoy!